By Sparky in Creativity on July 15, 2009 . 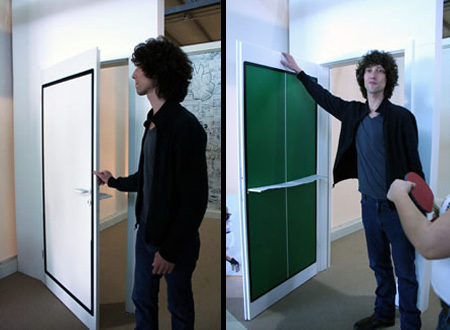 Designed by Tobias Fränzel, this innovative door turns into a ping pong table when needed. After the game is finished, it goes back to being a regular door. Ping Pong Door is perfect for people that live in small apartments. Hiya. I skimmed across this site by accidental but was happy that I looked a bit. My mother and I have started doing a ton of research regarding apartments in Italy and where to stay and other important stuff. By the way, thanks for the info – happy I found it by accident and will share. After the research I begun adding info about Italian apartments on my site.